Snakes Alive - Manitoba's Red-sided Garter Snakes! Snakes Alive - Manitoba's Famous Red-sided Garter Snakes! Check out our Narcisse Snake Dens page, for regular updates on the action up at the dens! May is "Snake Emergence Month"! After spending winter lazing about or sleeping soundly down below the frost line, Manitoba's snakes (all 5 species) emerge from their underground dens and get back to the business of being snakes. Our most famous snake, and probably our most common and best studied species, is the red-sided garter snake (Thamnophis sirtalis parietalis), one of 7 distinct subspecies of the common garter snake. This is the snake that has made Manitoba's Interlake region world-famous for snake-watching! Some snake dens (or hibernacula, singular = hibernaculum) contain 10,000 garter snakes each winter. In spring their mass emergence creates an awesome natural spectacle. The middle of May is usually the best time to visit the Interlake snake dens.You can visit the area yourself. Watch for the "Snake Den" signs a few kilometres north of the town of Narcisse, along Hwy #17. For some great information on Manitoba's red-sided garter snakes and the Narcisse Snake Dens check out the U-Haul Super Graphics website. (Click the "Learn More" button at the U-Haul site.) 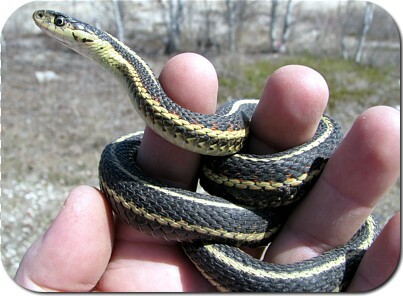 Or you can go to Manitoba Conservation's Snakes of Narcisse web site, too. Prepared by William H. Koonz, Manitoba Natural Resources, Wildlife Branch, 1991. Red-sided garter snakes have long attracted attention in Manitoba. It was fashionable in the 1880s to picnic at a large hibernaculum (winter denning site) near Stony Mountain. That den was at the center of Manitoba's first major labour strike. Penitentiary construction workers refused to work there until the den was destroyed. Other Manitoba communities (Inwood, Skownan, Crane River) happened to be built near or over major snake denning areas. Snakes are gradually being eliminated from these towns. Many dens have been damaged or destroyed by dynamite, oil, fire and the bulldozer. On the positive side, large dens remaining on private land are protected by landowners and Inwood has erected a garter snake monument in recognition of the large population of garter snakes living in the area. Five species of snakes breed in Manitoba. The red-sided garter snake has the largest range, is the most abundant and is the only species known to occupy large communal dens. Den sites include tree roots, shale cliffs, rock piles, sewers, foundations, animal burrows, rock outcrops and sinkholes. Dens contain from a few to over 10,000, but fewer than 5 dens are known to winter over 5,000 snakes. The four principal threats to snakes are destruction of habitat by humans, chemical pollution, commercial trade and periodic natural catastrophes. Snake management must ensure that the resource is self-sustaining when considering the future financial, educational and recreational needs of Manitobans. The purpose of this plan is to provide management rationale and guidelines for red-sided garter snakes over the next decade. The goal is to ensure that management efforts effectively deal with resource demands and public expectations. It will help to focus implementation and provide public awareness for long-term snake conservation in Manitoba. To ensure that healthy populations of red-sided garter snakes are maintained throughout their range. To maintain the integrity of major snake denning areas. To foster activities that permit Manitobans to benefit economically from the red-sided garter snake resource. To ensure that interpretive and educational programs emphasize conservation and recognize garter snakes as a vital component of our natural heritage. Red-sided garter snakes occur in suitable habitats throughout much of southern and central Manitoba, especially where denning areas exist near wetlands. Much of agricultural Manitoba is not suitable because of disturbance and marsh drainage. Roads and road construction, gravel extraction, land use changes and commercial picking have reduced snake numbers generally. Populations in the southeast corner of the province and along the east side of Lake Winnipeg are limited by a lack of den sites, cold temperatures and food scarcity. In western Manitoba, creek and river valley marshes provide summer habitat with major den sites in eroding shale outcrops. Snakes reach the northernmost extent of their range near Flin Flon. Population densities are greatest in the Interlake where a proliferation of marshes, shallow lakes and poor drainage offer ideal summer habitat and breaks in the limestone bedrock provide denning sites. Some dens are on islands where rock outcrops or pressure ridges provide access to suitable wintering habitat. Snake populations are assumed to contain equal numbers of males and females. Snakes grow throughout life, their length being related to food availability and lifespan. Females are typically larger than males of all year classes. Undisturbed snake dens contain many sizes of snakes, indicating that a number of year classes are present. Dens that have been disturbed or where harvest has occurred typically contain high percentages of small animals. Nearly all snakes more than 90cm long are females over 10 years old while males reach a maximum length of 75cm. The chances of a snake reaching 12 years of age are less than 1 in 5,000. There are no data to indicate that snake parasites or diseases regulate wild populations. In captive individuals, fungal infections and respiratory problems can be substantial (Narcisse den individuals have been observed with fungal infections). A parasitic fluke often causes wild snakes to lose the ends of their tails and may be responsible for breeding failures. Its incidence varies considerably from year to year and appears related to the fall condition of snakes (poor condition is associated with high fluke infestations). Crows, ravens, weasels, mink, raccoons, foxes, ground squirrels, skunks, hawks, owls and other predators kill snakes. Human developments (row crops, vegetation removal, road building, marsh drainage) can make snakes more vulnerable to natural predators. Recruitment for the red-sided garter snake is extremely slow. They do not breed for at least 3 years and likely breed every other year after that. First broods are seldom more than 1-5 young. Approximately 80% of the young do not survive their first winter and 50% of each year class dies annually thereafter. Adult females (over 80cm.) are vital to the well-being of all populations. These females produce as many as 40 young each at least every other year. A snake population cannot increase without a major component of adult females. Ideal summer feeding habitat includes large undisturbed areas containing ample ground cover, moist conditions and an abundance of invertebrates and amphibians. In denning areas, access to moisture (the ground water table) appears to be significant. Much of the provincial red-sided garter snake range has been severely degraded by land development, marsh drainage and road construction. Recent drought conditions have lowered ground water tables and contributed to a shortage of feeding and rearing areas. Of major concern is the protection of large dens, migration corridors, feeding and rearing areas from over- harvest, disturbance and development disruption. More data are required to determine how far and where animals move to feeding areas from specific dens so that migration routes can be preserved. Flooded dens have been difficult to re-establish and dens depleted by over-harvest have shown little sign of recovery. Several dens (Gypsumville, Broad Valley) have been severely damaged by snake pickers using steel bars to pry den structures apart to get at snakes. Leopard frog die-offs that occurred in the mid-1970's have yet to recover over much of southern Manitoba. Drought in the 1980's has reduced the quality and area of Manitoba's snake habitat. The agricultural use of insecticides has resulted in run-off waters concentrating toxic chemicals in marshes used by snakes in summer. The spraying of roadsides to control grasshoppers and mosquitos degrades snake habitat through toxic contamination and reductions in available food. For more on Manitoba's red-sided garter snake in NatureNorth: Narcisse Snake Dens | Snakes in the Classroom.